Maxis is doing another round of festive promos on devices with more discounts on selected phones. This promo however is tied with a 24 months contract with either a 3GB data plan or BIS Pro plan that comes with 3GB. So what’s interesting on the offer? 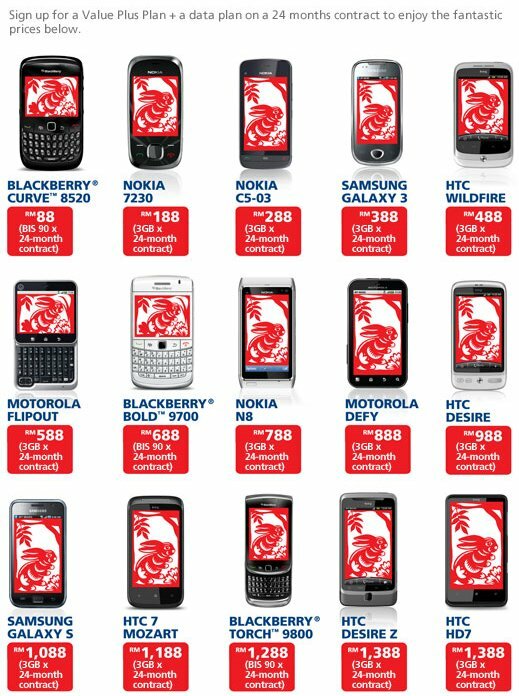 The Nokia N8 is now RM788 (usual RM999 with 24 months contract) while the Motorola Defy is now offered at RM888 (usual: RM999). The HTC Desire Z also sees a reduction to RM1388 (usual: RM1449). BlackBerries are reduced with a slight reduction on its older Curve 8520 and Bold 9700 but the Torch is further reduced to RM1288 from its previous 24 months contract price of RM1399. On the Windows Phone 7 line up, the HTC 7 Mozart is now offered at a much lower RM1188 (usual RM1499) while the larger HTC HD7 is offered at RM1388 (usual RM1699). To sweeten the deal for Samsung Galaxy Tab, Maxis is offering an outright price of RM1999 (original RRP: RM2699) with any purchase of a Value Plus Plan and data plan. As comparison, the Galaxy Tab is offered on contract at RM1749 over 24 months and RM1849 over 12 months. For more information, head to Maxis CNY Promo Page.